You cannot have a happy, healthy Westie if you offer him a poor diet. Fact! A balanced diet is key but selecting the best dried dog food is difficult. If your pup is fed a well-balanced meal plan, he does not require additional supplements of meat or vegetables. I have spent a great deal of time researching and analyzing a number of premium and vet recommended brands and selected dog foods best suited to a Westie's nutritional needs which will see him thrive and avoid any undue illnesses down the road often linked to a poor diet. This grain-free formula is a must for Westies with food intolerances as Natural Instinct's LID diet is formulated for dogs with food sensitivities. Natural Instinct receives four stars on the notoriously scrupulous review site dogfoodadvisor.com which further supports our choice. As expected this formula is rich in protein (32%) with its main source from turkey meal and turkey, which is a lean meat. It's free from gluten, potato, dairy, eggs, chicken, beef, and fish which can trigger food intolerance. It contains hypoallergenic tapioca an excellent ingredient which provides the starch instead of potatoes and has a good variety of fruits and veggies to help supplement the vitamin count. Nature's Variety offers a limited number of ingredients but offers optimum nutrition from nutrient-rich and easily digestible ingredients and is offered in small sized-kibble and freeze-dried raw pieces. Omega 3 and 6 fatty acids will help with maintaining a shiny coat and clear skin and Glucosamine and Chondroitin will help promote healthy joints in your dog. This recipe has a balanced amount of protein, fat, and calorie levels for small breed dogs with food insensitivity. All in all, this is a very solid food your Westie which comes highly recommended. First 5 ingredients: Turkey Meal (source of Glucosamine and Chondroitin Sulfate), Peas, Turkey, Tapioca and Canola Oil. Anchovy & Sardine Meal, Chicken Fat and Chicken Meal make up the main ingredients and it's great to see such a variety of protein-rich foods. The use of beet pulp is also nice to see since it is an excellent insoluble fiber source. There is also a good range of really nice fruits (papaya, blueberries, pomegranate etc. ), veggies (carrots, pumpkin, peas etc.) vitamins and minerals. I like the addition of probiotics and active enzymes, it is a great touch since it will help promote digestion and better absorption of nutrients. It also has a lower carb level than most foods. If your Westie suffers with food allergies or skin allergies, then we recommend giving this formula a shot. Only downside to it, is the slight fishy odor but if you or your pup don't mind it, then we cannot recommend this brand enough. First 5 ingredients: Anchovy and Sardine Meal, Chicken Meal, Peas, Chickpeas, Chicken Fat (preserved with Mixed Tocopherols). 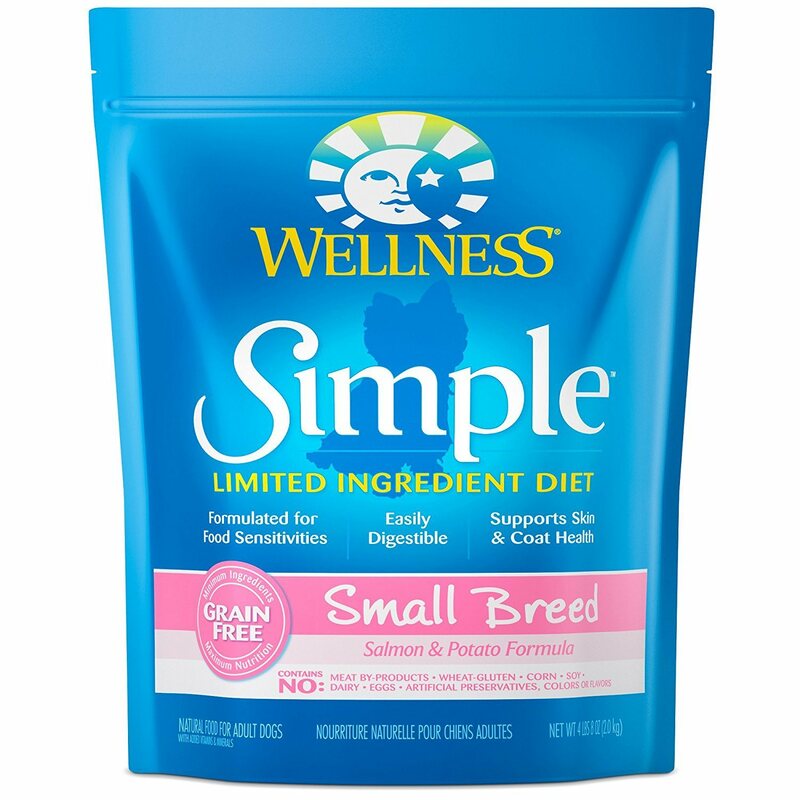 Wellness have made good quality dog food for a considerable time but their Simple Limited Ingredient Diet line is for small breed dogs that once again are prone to ingredient intolerances, food allergies or skin allergies. This salmon and potato formula has everything you would expect from a top-notch company. A high protein percentage (29%) and all quality ingredients. You won't find any fillers or by-products, nothing really you wouldn’t feed your Westie yourself. Not only that, we find a great range in their choice of vegetables and fruits, high levels of Omega fatty acids (3 and 6), and low levels of carbs. The use of both probiotics and prebiotics is great to see. If you are concerned about the quality of the food you are giving your Westie this recipe is another reason why you should definitely try it out. First 5 ingredients: SSalmon, Salmon Meal, Peas, Potatoes, Canola Oil (Preserved with Mixed Tocopherols). 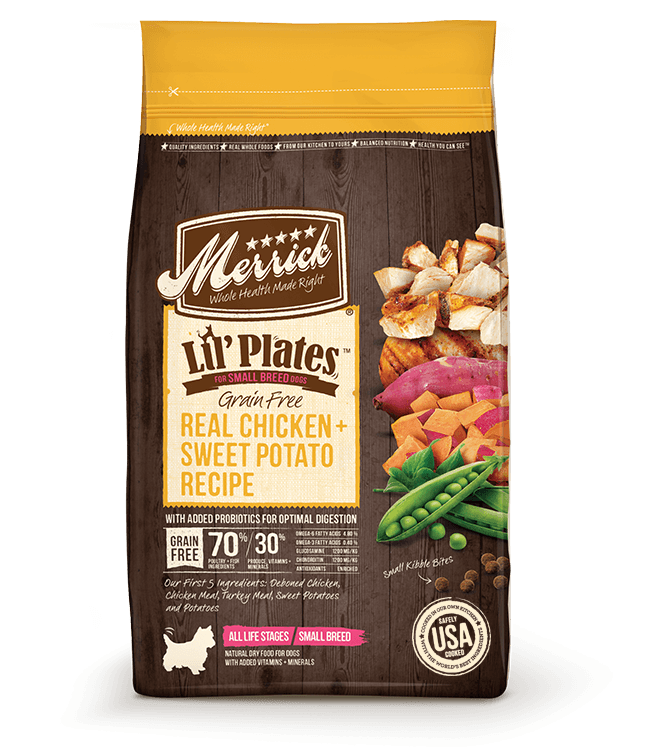 For the best small breed puppy food I have selected Merrick's Lil Plates Chicken recipe since it is balanced in its protein, fat and calories levels and is grain-free plus some of the lowest carbs I have seen. It meets AAFCO established nutrient profile for all life stages which means it can be fed to puppies, adults and seniors. Research suggests that small breed puppies require a higher caloric requirement , richer proteins but still have a controlled amount of carbohydrates. Three out of its five ingredients are meat sources which why this is such high-protein food (38%). 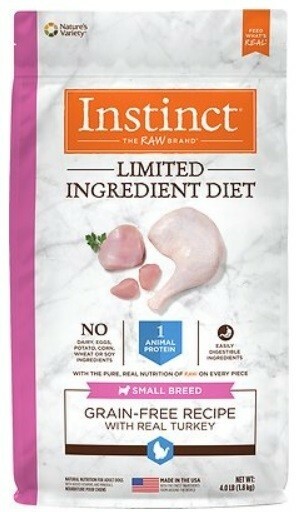 This recipe derives its protein from deboned chicken, sourced lin the USA, chicken meal and turkey meal and is rich with amino acids which is great for supporting the growth of healthy muscles and is packed with vitamins and minerals in particular chondroitin and glucosamine which is so vital to a growing pup's joints. Plenty of fruit and veggies gives other vital nutrients but also make this recipe palatable. There are no additives added or fillers, it's great for hypoallergenic breeds prone to sensitive tummies and provides a balanced diet which is why we rank it as the best West Highland White Terrier puppy food. West Highland White Terriers are known for being friendly, intelligent, independent, affectionate, joyful, loving, devoted, and demanding of attention. Westies are busy dogs that always seem to be into something. These hunting dogs actually started out with red fur, not like the white, fluffy ones they are famous for now. We recommend feeding your Westie a diet that takes into account the difficulties this breed faces: an upset and sensitive stomach, skin allergies and even diabetes. Daily calories requirement for a typical adult dog is around 550 whereas a senior Westie requires around 480 calories a day. We have selected to review the top 4 hypoallergenic foods which may help provide a solution to your Westie's constant battle with food intolerance. They are also prone to food allergies and skin allergies. We discuss how some of these can be self-corrected with proper nutrition and diet. After all a dog is what he eats! What Foods to Feed a West Highland White Terrier? It is recommended that owners do not feed their Westies canned dog food, which contain a lot of corn and wheat (even if they claim to be healthy). They also contain around 60-70% water and offer little in terms of nutrition. These ingredients are not good for dogs in high amounts, and should be avoided in most cases. Westies do well with diets that include healthy, whole ingredients like chicken, lean beef, fruits and vegetables. AAFCO make the following recommendations when feeding your dog. These percentages are based on a dry matter basis. 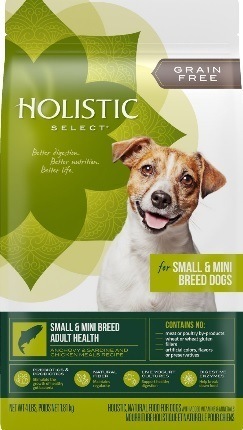 Popular brands like Wellness, Nature's Variety, Orijen and Holistic have formulas with the right ingredients to keep West Highland Terriers healthy and happy. These are holistic, corn and grain-free options that don’t use harmful preservatives of by-products. Owners that feed their West Highland Terriers premium dog food will see that they have happier, more energetic dogs with healthy skin and coats, and fewer digestion issues. However, all dogs should be fed foods that contain considerably more protein than the minimum currently recommended by AAFCO. Vets recommend that sum of protein and fat should be +45% and opt for limited carbs. How often and how much food should I feed my Westy? Depending on the size and age, a typical active Westy adult should eat between 124g -163g of high-quality dry food a day, divided into two meals. Calories required for a typical Westy adult is around 550 calories/a day and if you are between 480-500 calories for safe weight loss (2014 AAHA Weight Management Guidelines for Dogs and Cats). Westie puppies should be fed three times a day from age 6 to 8 weeks. From 8 weeks onwards pups can be fed two meals a day. Senior Westies should be fed smaller portions as these are more easily digested given their slower metabolism and to help prevent age-related conditions. Feeding West Highland White Terriers high quality dog food with "fit for human consumption" meat and wholesome ingredients is the main thing. As always be careful not to overfeed them, and consult your vet if you have any specific concerns or questions. Your chosen dog good packaging will also contain feeding guidelines which should give you all of the information you need to know, but remember take into account your dog’s age, breed, weight, and energy levels when determining how much to feed your pup. Starting there, you can make adjustments as needed. Like many different dog breeds, West Highland Terriers suffer from their own unique list of diseases and illnesses. These vary in severity and treatability, but as a rule feeding your dog a food which offers well balanced nutrients with responsibly sourced ingredients is one of the best ways you can maintain your Westy’s health and give them a happy, active life. A great tip I found to be a useful indicator of how good a diet was for my dog was the color, firmness and odor (yes...!) of his stool. Dogs should poop at least three times a day, be semi-firm in texture and not have an overly unpleasant odor. An inherited disease that affects the brain, and is fatal to Westies within a few months. The disease usually presents itself within 11 - 30 weeks and symptoms include muscle tremors and behavioral changes. This type of cancer seems to be more common in the West Highland white terrier breed. It is often fatal and early treatment is important to get this illness under control. A potentially fatal endocrine disease that is found more often in Westies than some other breeds. This disease basically occurs when your dog’s body can’t produce cortisol and/or aldosterone. Symptoms include gastrointestinal issues and severe cases are marked by very high potassium levels. This disease can be treated with medication. A disease that causes liver inflammation and damage due to a defect in the way the Westie metabolizes copper. This illness varies in severity and can be controlled, but signs that it has gotten worse are excessive drinking, loss of appetite, vomiting, and abdominal swelling. Dog food brands like Royal Canin Hepatic can help control this health issue in Westies, due to its reduced copper recipe and antioxidant blend for healthier immune system functioning. An inherited disease that affects young West Highland terriers. It involves an abnormal enlargements of the jaw which can negatively impact other bones in the head and make it difficult for Westies to chew and swallow, and cause pain when the dog opens its mouth. This disease varies in severity and is treated with pain killers, mostly. In order to make eating easier, owners of Westies with this illness can buy small kibble, soften their dog’s food, or even feed them wet food if it is easier.